Woof! I am Lyra! 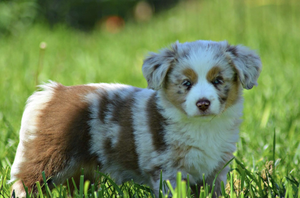 I am a double blue eye red merle mini aussie with a tail. I am staying small and compact. I won best of breed puppy class in 9/2018. My mom is an amber eye blue merle female small mini aussie. My dad is a double blue eye black tri mini aussie.